Before 8:00 that morning, four people had been shot, two were dead, and one man was in police custody. Dead are 36-year-old Ingrid Jack and 48-year-old Marva âHazel-annâ James, both shot once in their heads, while hospitalized due to gunshot wounds are Jackâs nephew Desroy Jack, 31, and Jamesâ 19-year-old son Simeon James. The victims were allegedly shot by Jackâs husband George Franklyn, following what witnesses describe as a fierce argument between Franklyn, also known as âChocolateâ, and his deceased wife, commonly called âAunty Lynnâ. According to Shelly-Ann Jack, she was at her bedroom window when she heard the couple arguing. Shelly Ann, who lives across the street from the deceased in an apartment complex owned by Ingridâs brother, said that after shooting his wife, Franklyn fired another shot then made his way to where she (Shelly Ann) lives. Franklyn was unable to get into the apartment through that door, because another resident of the house, John Matthews, had heard the explosions and had taken evasive action. Matthews said that he was up preparing breakfast for his two sons when he heard the gunshots and looked outside. Franklyn, however, managed to enter the house through an open window. Both Jack and Matthews say that from their places of refuge, they heard some doors being rattled as someone, whom they believed to be Franklyn, tried to gain entry to rooms of the house. Franklyn fired two shots inside the house at another of the tenants, but missed, before exiting and continuing on his shooting spree. 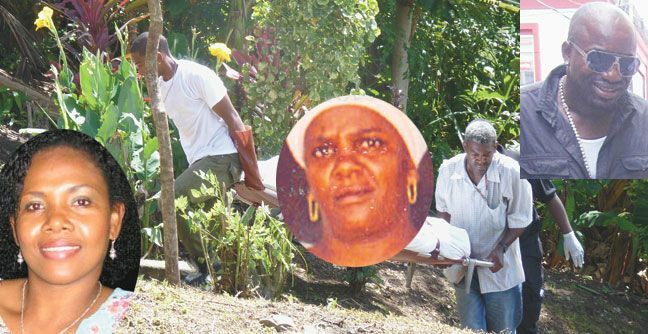 When back on the main road of the village, the gunman saw and fired a shot at Sharon James, who had come outside when she heard the initial shots. James, believed to be one of Franklynâs targets, retreated to her home with Franklyn in pursuit. At that home, Franklyn encountered his second victim Marva, also known as Hazel-ann to residents in the community, having breakfast in her porch. The gunman shot the postal worker/ vendor at close range before entering the house, then shot her 19-year-old son Simeon as he lay sleeping on the living room floor. Simeon had just returned home from his night shift duties at the East Caribbean Group of Companies (ECGC). Franklynâs death march took him to the nearby home of an older sister of his deceased wife, where he encountered and shot her nephew Desroy Jack once in the right leg. The two men got into a scuffle when Franklynâs gun jammed, and the wounded Jack also received an ice pick stab to his upper arm, before escaping with his life. Franklyn was soon after apprehended by police officers who were called to the area when the initial shots rang out. Speculations are rampant as to the reasons for Franklynâs rampage. Rumours that the deceased Jack had initiated proceedings to divorce her husband could not be confirmed by SEARCHLIGHT, as a search at the Registry turned up no evidence of divorce papers being filed. The couple were the parents of a daughter, who turned five years old on Wednesday, while Ingrid herself celebrated a birthday last week. Tuesdayâs events follow the publication in July of an Inter American Commission of Women report which puts St. Vincent and the Grenadines out front for female homicides in the Organization of Eastern Caribbean States (OECS) between 2000 and 2011. Only last week Thursday, the National Council of Women convened a workshop aimed at increasing awareness and the prevention of domestic abuse and violence against women. The fatal shooting of Jack and James bring to 17 the number of homicides reported in St. Vincent and the Grenadines for the 2011. Of these, four of the victims were females, the first for the year being six-year-old Ziya Garraway of Fairbaine Pasture, who was killed by her 42-year-old mother on March 31. As recently as Sunday, August 14, 33-year-old Greiggs resident Stephmnie Daniel died of a stab wound to the neck inflicted by her ex-boyfriend Aubrey Wilson.